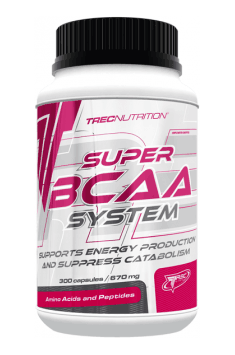 Super BCAA System 300 caps. Take 1 capsule per each 10 kg of body mass, 45 minutes before training. Take 1 capsule per every 20 kg of body mass, 2 times a day, 30 minutes before a meal. BCAA is recommended to physically active people both during the periods of building muscle mass and reducing fatty tissue. In practice, the most widely used portions are 7-20g, hence the assumption that 10g of BCAA a day is an optimal value to work in the organism. A single, effective dose of BCAA will contain 2,5 g of leucine.